Wedding Cake Trends 2018, Unique Styles to Celebrate Love. 2018 Wedding Cake Trends: 11 Unique Styles to Celebrate Love! Planning to tie the knot this coming year? The latest 2018 wedding cake trends are emerging, and they’re certain to delight. Ruffles, as a design concept, aren’t entirely new. Historically, they’ve been used more as borders or in tightly-crimped waves across cakes. Now, we’re seeing sweeping ruffles that feel more like flowers unfurling or waves across a pond. Because they have a very natural look, they’re often used on rustic or earthy cakes, but they can also add a hint of femininity to any style. Ruffles can be incorporated with either fondant or buttercream, so they can work no matter what your preference is. This particular cake was done up by our very own Cove Cake Design. 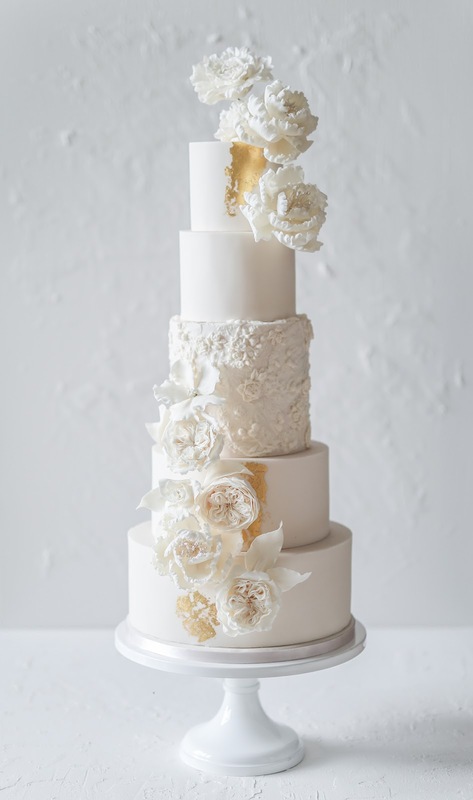 Arguably, one of the most stunning 2018 wedding cake trends is the use of gold leaf. This is typically real gold, and when it’s very pure, it’s safe to eat. Professional cake designers purchase a special type of gold leaf that’s designed to be consumed, and it typically comes in sheets or flakes. 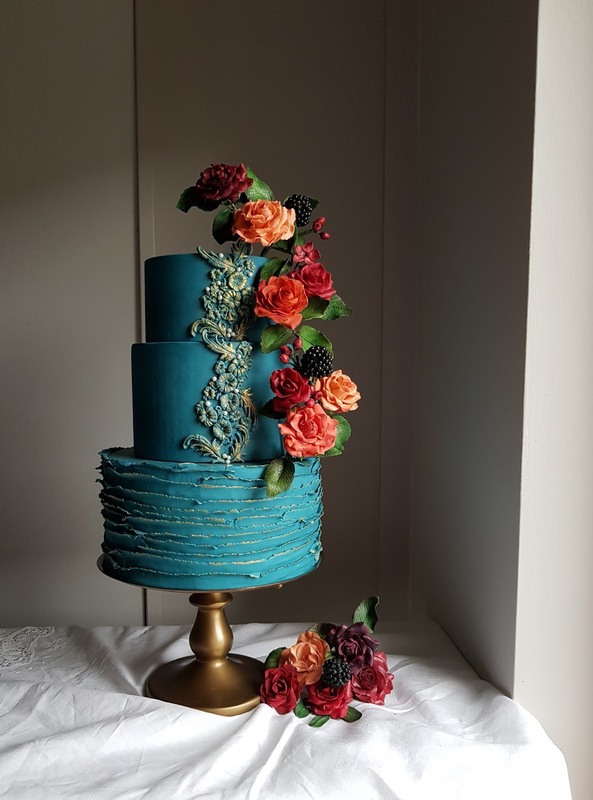 People who really want to have a lavish cake that stands out may opt to have a full layer of gold leaf, but the more trendy option is to work it into rustic chic and vintage designs, such as the one pictured here by Cupcakes and Counting. It adds just enough glamour to kick the design up a notch, without being overly showy. The novelty of macaron towers is making them a very attractive choice for couples, but design application is evolving here as well. When they first became a wedding cake alternative, most any type of macaron in any display gave couples a unique and fun change, but now we’re starting to see them take on many of the same trends wedding cakes are. For example, rustic, rustic chic, and vintage are in, as are having unique flavour combinations and offering a selection of flavours to suit the guests. This macaron tower is the lovely creation of MMCookies. 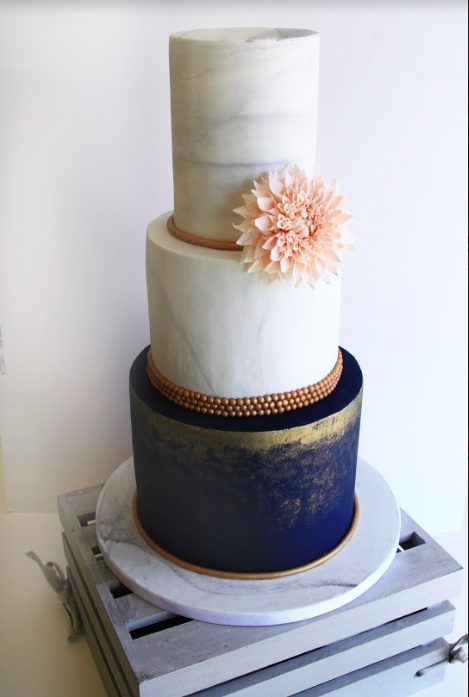 The marble effect is most often used on modern minimalist cakes. 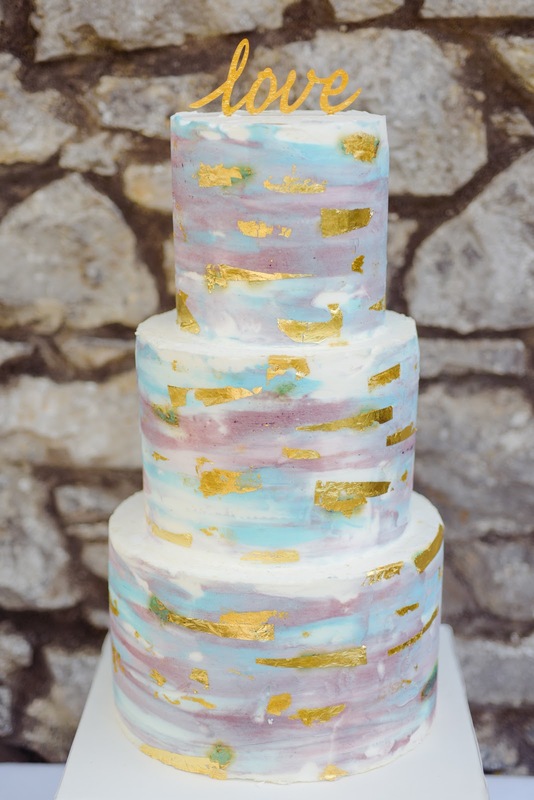 It creates a striking and elegant look that’s often paired with gold leaf or bold colours, such as the cake that’s pictured here. Cakes by Lynzie is responsible for this beautiful piece, and it does a great job of highlighting the diversity of her skills. Geode cakes look raw and beautiful at the same time; a true natural wonder for those who want something strikingly unique for their nuptials. Although the geodes look like sparkling gemstones, they’re actually crafted with rock candy and sugar crystals, so they’re completely edible too. 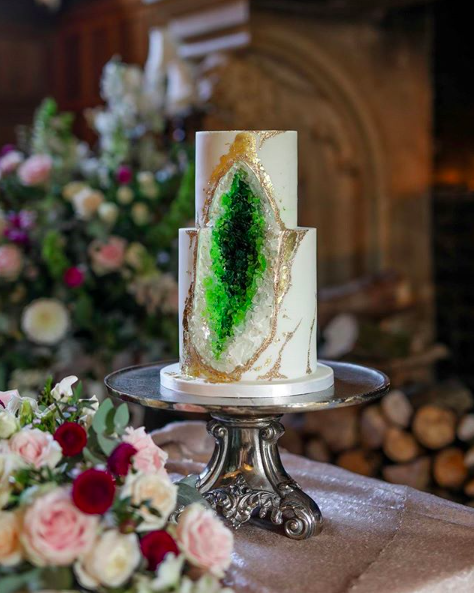 Some couples ask the baker to model the geode after a special piece of jewellery, while others simply have it designed to match the wedding colours. Whether it’s our growing adoration for the vintage and rustic trends or some carryover from unicorn colours, more and more couples are skipping the idea of a white wedding. This particular cake from Something Sweet Malahide also covers the blue from the “something borrowed, something blue” rhyme we associate with good luck at a wedding. The blue represents love and fidelity. 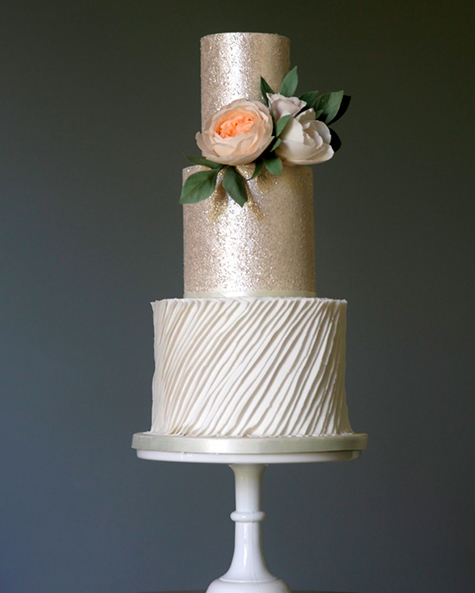 If you haven’t noticed an underlying theme yet, glamour and decadence are making their way back into wedding cakes. 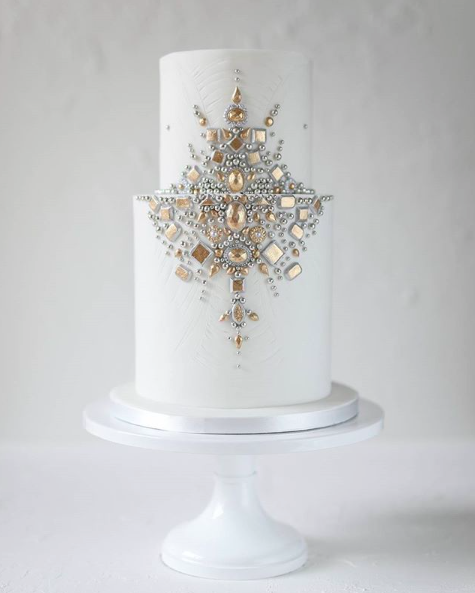 Just as the sparkling geodes are crafted with sugar, the diamonds in wedding cakes are also typically sugarcraft too. The classic way to include jewels is on a crisp white wedding cake, like the one pictured here by Cupcakes and Counting. However, with vintage coming back into style, we’re seeing more backdrops of bold colours, such deep purples, navy, and even black. These are still usually paired with “diamonds” for an elegant look, but coloured stones, such as faux rubies, emeralds, and sapphires are being used too. The watercolour effect is showcased in a number of ways. Here, we see it much like the marble look, but with more colours interspersed. This particular one by Cakes by Dawn appears to be using multi-coloured fondant, which gives it a natural look, but some designers also paint their cakes, giving them more control and the ability to integrate flowers and other designs into the cake itself. Exuberant and fun couples are often drawn to drip cakes. Though they’ve been around for quite some time, the newer styles are quite indulgent, whimsically topped off with candies, cookies, chocolates, macarons and more, such as this one by Cherub Couture Cakes. Those who appreciate the decadence of drip cakes, but prefer a more refined approach, may opt for all chocolate or chocolate and salted caramel, or may add slight embellishments to it, like gold leaf, flowers, or sugar art. 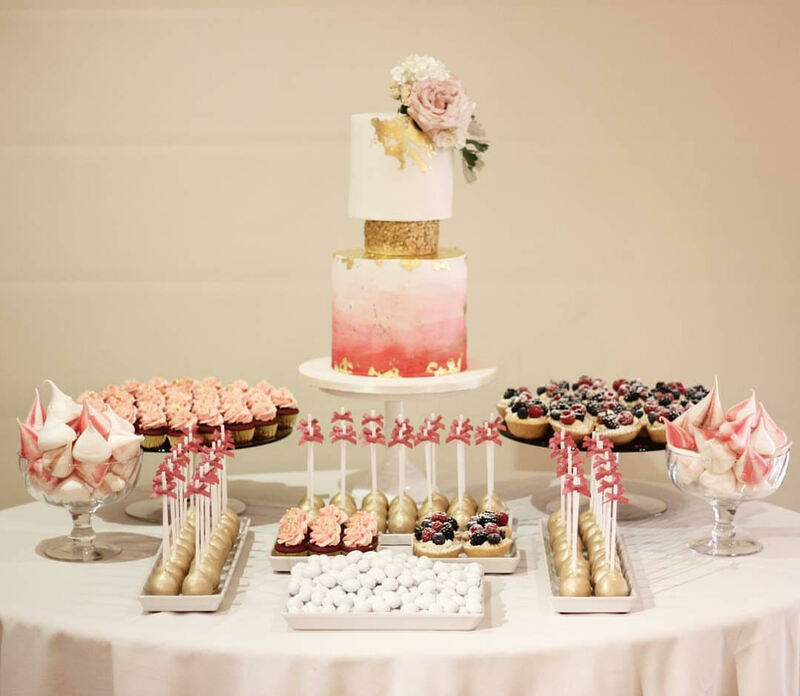 Dessert tables aka dessert bars are growing in popularity for a few reasons. First, many couples simply want something non-traditional. 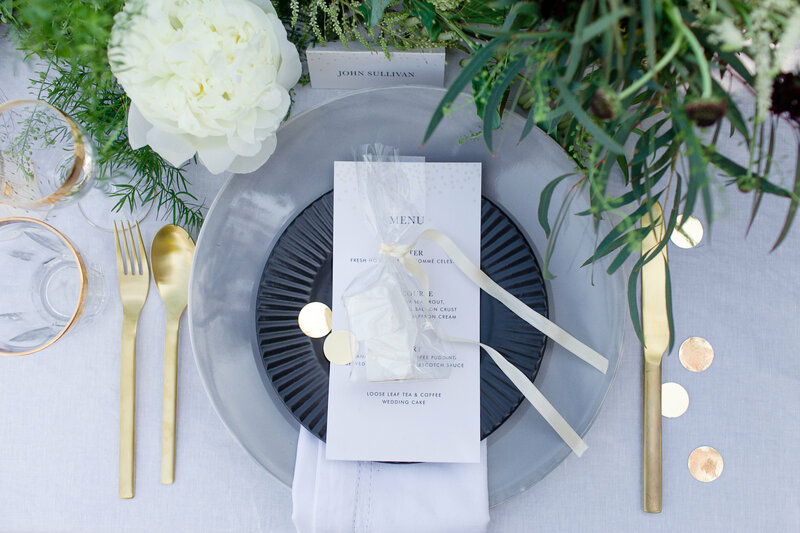 Secondly, there has been a huge surge in special dietary restrictions, so in order for the couple to meet the needs of their guests, it’s helpful to have vegan, gluten-free, and diabetic-friendly options. Lastly, there are a whole lot of choices out there for wedding cake alternatives, and many of those who are torn between choices decide not to choose at all. They just serve a bit of everything. 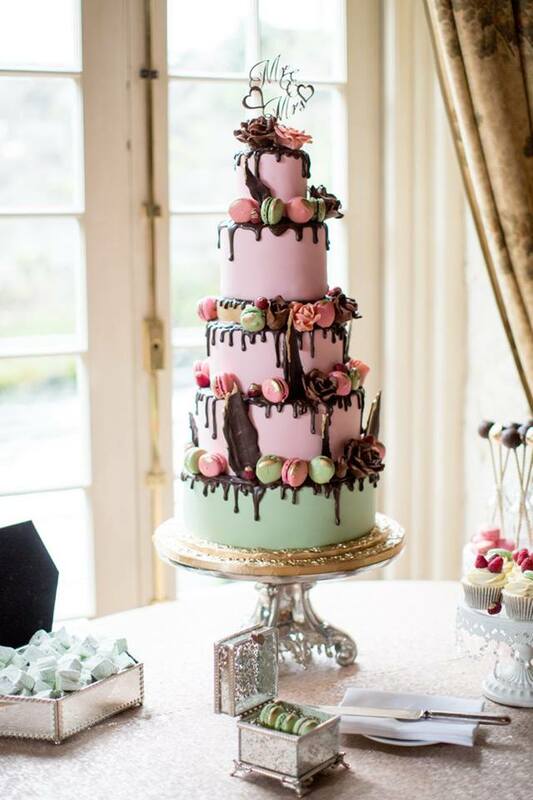 Some of the most common offerings include cupcakes, cake pops, meringues, and macarons, as well as a smaller wedding cake to keep something more traditional on the table and enable the couple to honour the tradition of cutting the cake together. 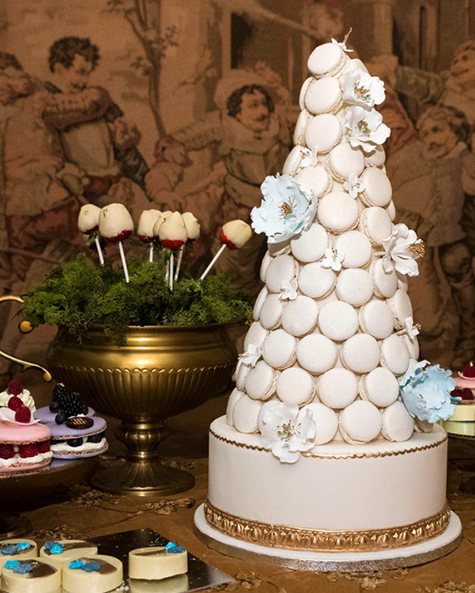 This dessert table is the glorious work of The Cake Cuppery. Although technically not a 2018 “wedding cake” trend, various treats have worked their way into pop culture and have become a celebratory mainstay. Earlier versions of the marshmallow favour were done up more like cake pops, crafted into shapes like bells and cakes, and iced to decadent perfection. Nowadays, people tend to go one direction or the other; either minimalist “naked” look, like with cubed marshmallows, or marshmallows covered in dripping chocolate and coated with candy. S’mores-themed favours are also becoming more popular. 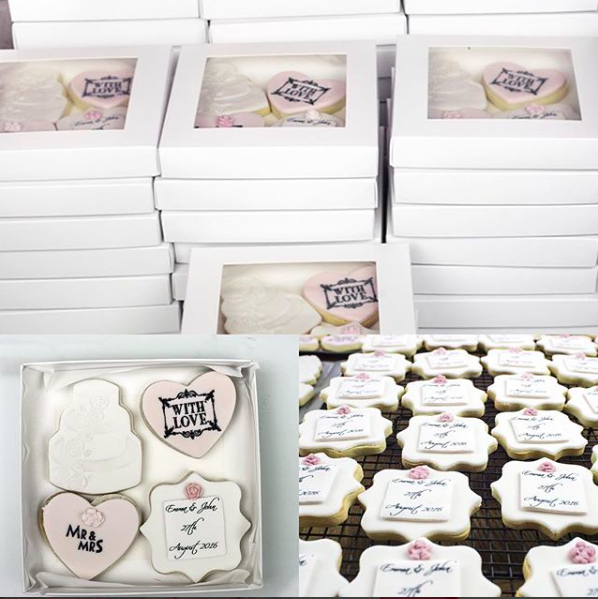 Customised cookies and macarons are also gaining more interest. The treats are generally individually-packaged and ready for the guests to take home with them at the end of the event. 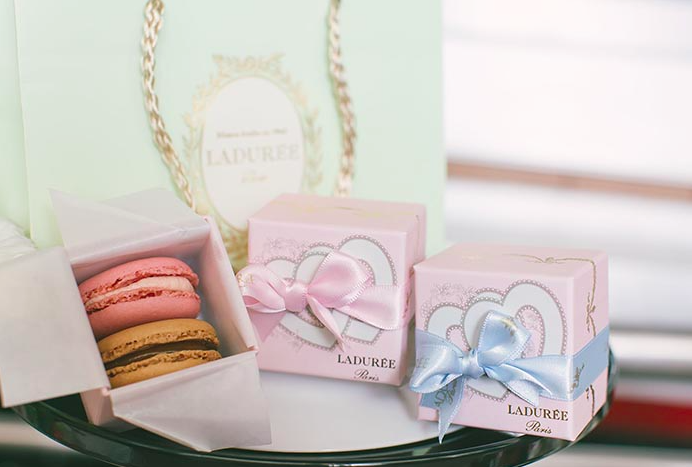 In the photos above, you’ll see marshmallows by Delish Melish, macarons by Laduree, and custom cookies by MM Cookies. Looking for More 2018 Wedding Cake Trends? If you like a particular style featured here, be sure to click the link in the description to check out more of the designer’s work or inquire about an order. 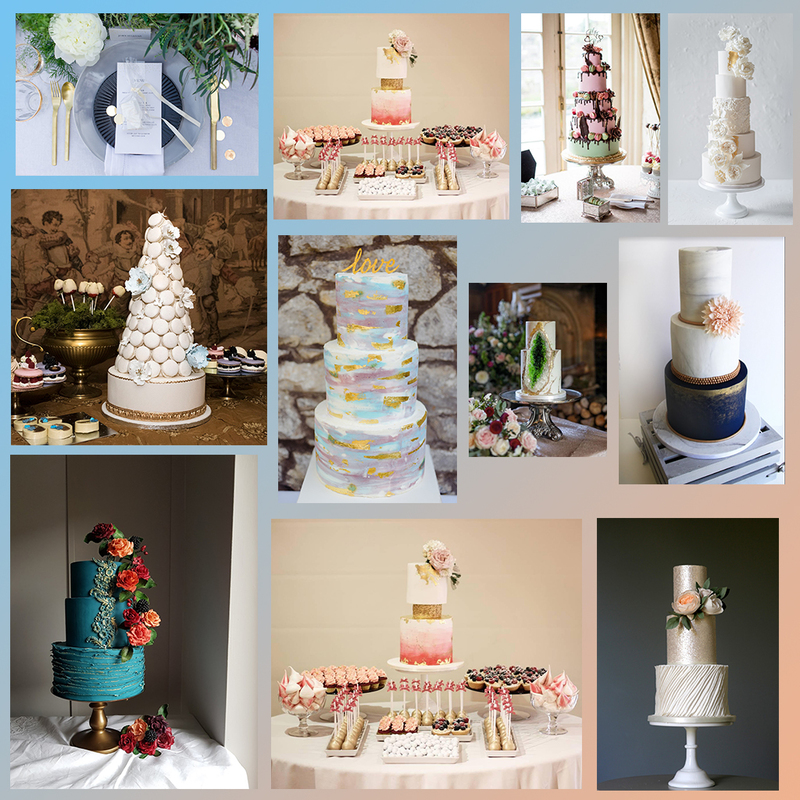 You’ll also find more 2018 wedding cake trends from our fabulous and talented local bakers by visiting our Bridal Boutique Pinterest-style inspiration board. 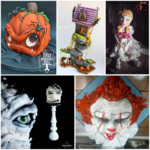 Are you a cake designer who would like to be featured in a future blog? We’d love to meet you! Just head over to our sign-up page and set up your profile page. You’ll gain access to a whole bunch of tools and resources designed to help you grow your business and just might be featured in one of our future blogs. 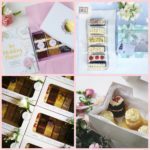 Bakers and Cakers connects those who want to buy cakes with those who love to make them! 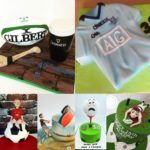 Our online market place provides Bakers and Cakers with a profile to showcase their work - while making it easy for you to find the perfect cake for every occasion.